Factory Porsche aces Marc Lieb and Patrick Long will join American outfit Competition Motorsports for February’s Liqui-Moly Bathurst 12 Hour. The duo will partner David Calvert-Jones in a Pro-Am Class Porsche 911 GT3 R, to be run at Bathurst by crew from Porsche Motorsport North America and Australian team McElrea Racing. 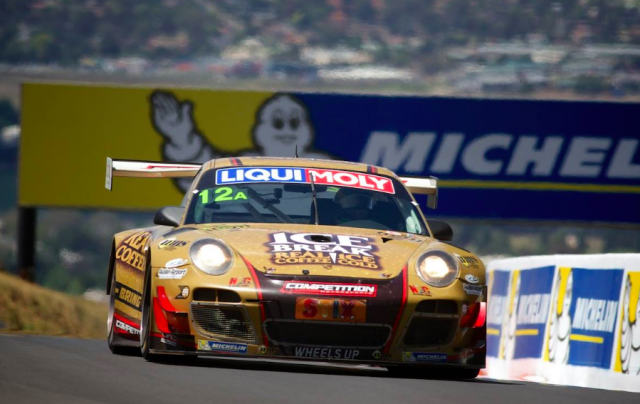 Backing will come from Ice Break Iced Coffee, which sponsored Calvert-Jones’ Porsche entry in last year’s Bathurst enduro. Long was also part of the 2015 12 Hour campaign, while Lieb has just one previous Bathurst start, driving in the 1000km Supercars race with Tekno Autosports in 2013. “The Bathurst 12 hour event has really come of age,” said Calvert-Jones. “We are now seeing numerous factory supported GT3 programs focusing on this iconic endurance race and I’m so excited to get back to Australia and race at Mount Panorama. Competition Motorsports will be complete a shake down with the car in Los Angeles next Friday before the race car is packed into a container and shipped to Australia for arrival in early January.